Football bladders are similar to an inner tube. When the air valve fails or the bladder is punctured, the best solution is replacement. Not all footballs have independent bladders, and you identify these by molded laces. 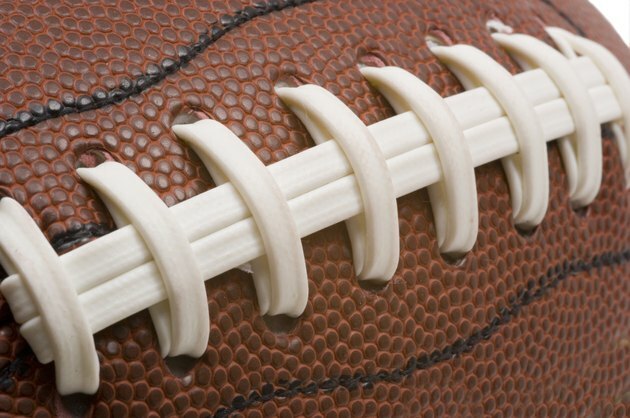 Footballs with bladders have polyester laces across the seam of the ball that you replace as part of the procedure. Obtain the new bladder, a new lace and a lacing guide to replace a football bladder. Insert a needle valve into the inflation hole on the ball. Squeeze the ball with both hands until it is fully deflated and remove the needle valve. Skip this step if the football is flattened or already deflated. Cut the laces along the seam carefully with the points of scissors and pull the laces out by hand. Spread the seams apart by hand to access the bladder. Reach inside the ball with one hand and put your fingers against the base of the inflation tube. Work the inflation tube away from the inner surface of the ball. Remove the bladder by pulling it out through the seam. Discard the old bladder. Position the new bladder along the seam of the football. Align the inflation tube with the hole in the ball where the old tube was removed. Hold the tube in this position with one hand as you tuck the ends of the bladder into the ball. Reach inside the ball with one hand and push the end of the inflation tube through the hole in the ball. Pull the tube from the outside until the bladder is tight against the inside of the ball. Cut the inflation tube with the scissors, 1/2 inch from the outer surface of the ball. This allows you to partially inflate the ball for lacing without the tube retracting inside the ball. You will trim the inflation tube flush after the ball is laced. Put the ball flat on a stable surface with the inflation tube up. Attach the needle valve to an air pump. Moisten the end of the needle valve with water and insert the valve into the tube. Inflate the ball partially until the bladder is stable inside the ball. Pull the needle valve out of the inflation tube and set the pump aside for now. Uncoil the new polyester lace. Refer to the lacing guide and lace the seam of the football using a lacing awl. Cut the ends of the lace as described and tuck each end firmly under the laces with the point of the awl. Moisten the needle valve and inflate the football fully with the air pump. Carefully trim the excess portion of the inflation tube flush with scissors.